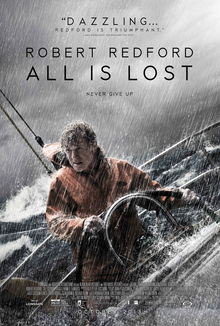 Whether understood on a literal or an allegorical level, All Is Lost is a compelling film. Set in a lonely expanse of the Indian Ocean — “1700 nautical miles from the Sumatra Straits” — it stars Robert Redford as an unnamed yachtsman, whose vessel has been compromised in a freak accident. Concerned yet resolute, “Our Man” (so dubbed by the credits) initially seeks to repair his boat, but a series of storms renders it unsalvageable. He is then forced to retreat to a life raft, where he can do little but wait for a rescuer. Short on rations and vulnerable to the sea’s caprice, the sailor is not only in a struggle with time but also with his own insignificance opposite the forces of nature and of men. Yet, director J.C. Chandor wants All Is Lost to go beyond a bare survival story. After all, unlike other animals, human beings confront their mortality reflexively. That is to say, the human being views his or her peril not as a mere member of the species but, rather, as an “I” or a “thou.” Thus an early voiceover — practically the film’s only words — discloses that the sailor has loved ones and is concerned about their well-being. Moreover, in his plight, he is painfully aware that his life has fallen short of what he and others have desired. He has “tried” (as he repeatedly stresses) to do the right thing, but his efforts have led to disappointment. “I’m sorry,” he concludes. But what is it to be “sorry”? In his Concluding Unscientific Postscript, Søren Kierkegaard argues that to be sorry or to recognize one’s own guilt is a qualification of immanent religiousness. In other words, it is not a quality exclusive to Christianity but, rather, belongs to every human attempt to understand life in relation to an ultimate happiness. For, over against even the possibility of an ideal existence, human beings can see that it is not something they can achieve on their own. One can try to be a perfect father or scholar or athlete — to use mundane examples that Kierkegaard, admittedly, would not prefer — but will realize soon enough that such attempts are futile. Here an abyss opens up. Human beings cannot be what they want to be. And, Kierkegaard adds, any earnest confrontation with this fact will result in sorrow, not just in a general sense, but in a personal one. Against the backdrop of our finitude, brought into sharp relief by the encroaching specter of death, we become sorry for our failures, for all that we wanted to do but didn’t. Of course, Redford’s character is not philosophizing in this way, but his statement of apology doesn’t seem like an accident either. It is an appropriate reaction to the myriad of weaknesses that constitute human existence. Moreover, it opens up new possibilities for the film’s ending. Without giving it away, I’ll just say that another dimension of Kierkegaard’s analysis of the religious life emerges, wherein the deepening of, or the descent into, immanent religiousness makes the individual receptive to salvation — indeed, a salvation from beyond the person’s own capability. One might call it a salvation from above.